This article is about the American singer. 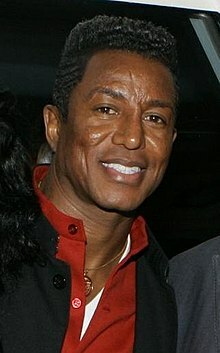 For other people named Jermaine Jackson, see Jermaine Jackson (disambiguation). Jermaine La Jaune Jackson (born December 11, 1954) is an American singer, songwriter, bass guitarist, and member of the Jackson family. He was a member of The Jackson Five, a singing group composed of four of his brothers and him, from 1962 to 1975, where he was the second lead vocalist (after his brother Michael) and played bass guitar. Jackson sang the lead on some of their songs and had featured vocals on many others, including many of their biggest hits such as "I'll Be There" and "I Want You Back". When the group left the Motown label and reformed as "The Jacksons", Jermaine stayed with Motown, due to loyalty to Motown founder Berry Gordy, whose daughter he had married, and was replaced in the group by youngest brother Randy. He rejoined the group in 1983, and has remained with them since, through various breakups and reunions. Jermaine also had a solo career concurrent with his brother Michael's, and had a number of top-30 hits throughout the 1970s and '80s. He also produced and recorded duets with American singer Whitney Houston in her early years as a recording artist, and was a producer for the band Switch. Jackson was born December 11, 1954, in Gary, Indiana, after his brother Tito Jackson. He is the fourth child born to Joseph and Katherine Jackson. His siblings are Rebbie, Jackie, Tito, La Toya, Marlon, Michael, Randy, and Janet. His father Joseph had musical aspirations, playing guitar with his brother’s band, The Falcons, and Katherine was a passionate pianist and singer, but their large family and lack of money ended their dreams with Katherine becoming a housewife, and Joseph, a steel worker at nearby Inland Steel Company in East Chicago, Indiana, (his parents lived there before they moved to Gary in 1950). While his father worked long hours as a crane operator, Jermaine and his brothers, Tito and Jackie, secretly practiced their own songs using their father's guitar. Jermaine became the original lead singer of the Jackson Brothers—an earlier incarnation of The Jackson Five until 1966, when younger brother Michael began singing lead. Jermaine would continue to provide some leads over the years. Jermaine graduated from Birmingham High School in Van Nuys, Los Angeles, California in 1973. Jermaine and his brothers first signed as The Jackson Five with Gordon Keith of Steeltown Records in November 1967, and their first single "Big Boy", was released on January 31, 1968. After the group recorded three more songs with the Steeltown label (on two records) they were signed with Berry Gordy of Motown Records in 1969. As the co-lead singer of The Jackson 5 after his brother Michael, Jermaine sang notable parts of "I Want You Back", "ABC", "I'll Be There", "The Love You Save", "Dancing Machine", and many other Jackson 5 songs. Jermaine performed as part of the group for six years. Not feeling that they were being paid fair royalties by Motown Records for their success as well as their desire for creative control, the Jackson 5 decided to leave the label and sign with Epic Records in 1975. However, Jermaine decided to stay with Motown Records, citing loyalty to the company as the reason. Others argue that Jermaine's marriage to Motown founder Berry Gordy's daughter Hazel, whom he married in 1973, was a deciding factor. Jermaine split from the Jackson Five to start a solo career at Motown, and was replaced by his brother Randy Jackson. Unbeknownst to the group, Gordy had trademarked the name The Jackson Five and did not allow the group to continue using the name when they left the label. Once signed with Epic, the group became known as The Jacksons. Several years later, in 1983, Gordy asked the group to perform at the Motown 25: Yesterday, Today, Forever television special. After the success of the broadcast, Jermaine rejoined the band to record the album Victory which featured all six brothers on the Jackson's album cover. Jermaine also participated in the band's Victory Tour. He stayed with the group for their final album, 2300 Jackson Street, in 1989. In 2001, he reunited with his brothers to perform for the Michael Jackson 30th Anniversary Special. Like Michael, Jermaine began a solo career while still a member of The Jackson Five, and had a hit with the 1972 Shep and the Limelites cover "Daddy's Home". It sold over one million copies by March 1973, and was awarded a gold disc. When The Jackson Five left Motown, Jermaine left the group and stayed at Motown. Jermaine was nominated for the Grammy Award for Best Male R&B Vocal Performance for his 1980 album Let's Get Serious. He had a number of Billboard Top-30 hits throughout the 1970s and 1980s, including "Daddy's Home" (#9), "That's How Love Goes", "Let's Be Young Tonight", "Bass Odyssey", "Feel the Fire", "Let Me Tickle Your Fancy" (featuring Devo on backing vocals) (#18), "Let's Get Serious" (#9, also one of his only two UK hits, peaking at #8), "Dynamite" (#15), "Do What You Do" (#13), and "I Think It's Love" (#16). A duet with his brother Michael, "Tell Me I'm Not Dreamin' (Too Good to Be True)", hit number one on the dance chart in 1984. Michael and he also collaborated with Rockwell, both providing guest vocals on his 1984 hit single, "Somebody's Watching Me". In 1985, his duet with Pia Zadora, "When the Rain Begins to Fall", topped several singles charts in Europe. His final chart success, 1989's "Don't Take It Personal", hit number one on the R&B singles chart. Some of Jermaine's finest moments as a singer can be heard in the soulful "Castle of Sand" and the Earth Wind & Fire-inspired "You Need To Be Loved". Jackson is proficient on the electric guitar and is a talented bass guitar player. At an early age, he performed the parts of legendary bass player James Jamerson and others when the Five performed live. Jermaine also composed and produced for other artists, such as Switch, and he produced and sang duets on Whitney Houston's debut album for Arista Records. Jackson was the first housemate to enter the Celebrity Big Brother UK house in 2007. After leaving Big Brother, Jackson did several interviews on UK television explaining why and how he took his peaceful and mediating stance in the Big Brother house. He also spoke about the Jackson Five reuniting for a performance. Jackson was part of the second season of the CMT reality show Gone Country. On the premiere episode of season three of the ABC reality show Celebrity Wife Swap on April 15, 2014, Jermaine Jackson and his wife Halima swapped places with Daniel Baldwin and his on-again, off-again girlfriend Isabella Hofmann. In the episode, Jackson refused to comply with Isabella's request that he put some of his clothing in storage. He also refused to provide a status report to the producers after the swap was completed. In April 2007, Jackson returned to the UK to take part in a one-off special of ITV's Challenge Anneka. On the same trip, he appeared in Glasgow with British Prime Minister Gordon Brown, speaking in support of Searchlight magazine's anti racism campaign, the Daily Mirror "Hope Not Hate bus". On November 23, 2007, Jackson appeared on Katie & Peter: Unleashed and again talked of a reunion with his brothers on a tour the following year. In 2008, Jackson flew to Australia to be a guest judge and mentor for the top-five Michael Jackson night on Australian Idol. In March 2008, Jackson was the guest of honor at the Muslim Writers Awards in Birmingham. Jackson attended the memorial service for his brother Michael on July 7, 2009, at the Staples Center in Los Angeles. He acted as a pallbearer, and performed the song "Smile" by Charlie Chaplin, which was believed to be his brother's favorite song, in tribute. In 2009, following the death of his brother Michael, Jermaine appeared on the A&E television series The Jacksons: A Family Dynasty, documenting what was supposed to be a 40th-anniversary reunion between Jermaine and his brothers. The series lasted one season and Jermaine, along with his three surviving brothers, was listed as an executive producer. In October 2010, Jermaine played a concert at the Planet Hollywood hotel and casino in Las Vegas, naming it "40 Years of Jackson Music" and dedicating the concert to Michael. He wrote the memoir You Are Not Alone: Michael Through a Brother's Eyes. In a 2012 interview with Luka Neskovic, for The Huffington Post, Jackson said that his brother planned a reunion with him: "... the plan was to do some shows with the brothers, as well, after he finished his commitment with the "This Is It", and we probably gonna do some songs with him on the "This Is It" tour". In October 2012, Jackson released I Wish You Love, his first solo album in 21 years, consisting mostly of jazz covers. The album was arranged and produced by French opera singer David Serero, who recorded a duet on "Autumn Leaves" with Jermaine, and was released by David Serero Productions. They both performed You Are Not Alone, The Musical, written, directed and produced by Serero, in France in January 2013. The following year, You Are Not Alone, The Musical Live was released on video and audio. In January 7, 2016, Jermaine and his brothers performed at the Planet Hollywood hotel and casino in Las Vegas once again, at a concert event, naming it "Heal the World: A Tribute to Michael Jackson". A big-name roster of music stars performed the music of the King of Pop at the concert. Jermaine La Juane "Jay" Jackson Jr., (born January 27, 1977). Jermaine Jr. and his longtime girlfriend, Asa Soltan Rahmati, have a son, Soltan Soul Jackson, born on January 20, 2017. Autumn Joi Jackson (born July 10, 1978), married to producer Narinder Singh. Jaimy Jermaine Jackson (born March 17, 1987). Jeremy Maldonado Jackson (born December 26, 1986). Jourdynn Michael Jackson (born January 5, 1989): Jourdynn is married to Marike Le Roux. Jaafar Jermiah Jackson (born July 25, 1996). Jermajesty Jermaine Jackson (born October 3, 2000). In January 2004, Jackson met Halima Rashid while in line at Starbucks. In March 2004, he proposed to her and five months later, they were married in a mosque in Los Angeles. Rashid was arrested on November 28, 2015, in Los Angeles for alleged domestic violence. Rashid filed a petition for divorce on June 21, 2016, citing irreconcilable differences. Jackson, like the rest of his family, was raised as a Jehovah's Witness. In 1989, he converted to Islam after a trip to Bahrain in which he was impressed by the local children's devotion to their religion. Jermaine supported his brother, Michael, during the 2005 child-abuse trial. He came to Michael's defense on CNN's Larry King Live and appeared with him in court on many occasions. On June 25, 2009, Jermaine held a press conference at Ronald Reagan UCLA Medical Center and broke the news of Michael Jackson's death to the media. He was voiced by Joel Cooper on the 1971-72 animated series The Jackson 5ive. He was portrayed by his son, Jermaine Jackson Jr., in the 1992 miniseries The Jacksons: An American Dream. He was portrayed by Jason Griffith in the 2004 film Man in the Mirror: The Michael Jackson Story. He was portrayed by Kenan Thompson in a 2010 skit on the sketch comedy show Saturday Night Live. In the NBC television show Parks and Recreation episode S07E03, the ballroom at the convention center is named "Jermaine Jackson Memorial Ballroom". 1982 The Facts of Life Himself Episode: "Starstruck"
2014 Celebrity Wife Swap Himself Episode: "Daniel Baldwin/Jermaine Jackson"
^ a b c d e f g h i j k l m n o p q r s t u v w x "Biography: Jermaine Jackson Lifetime". Archived from the original on January 30, 2016. ^ a b Jackson, Katherine; Rich Wiseman (1990). My Family, the Jacksons. St. Martin's Paperbacks. ISBN 0-312-92350-3. ^ a b c d "History 60–68 – The Jacksons – The Official Website". ^ "Vol. 44, No. 26". Jet. Johnson Publishing Company. September 20, 1973. p. 55. ^ "History 1975 – The Jacksons – The Official Website". ^ a b c "History 1980 – The Jacksons – The Official Website". ^ "Michael Jackson: 30th Anniversary Celebration". November 13, 2001 – via IMDb. ^ Murrells, Joseph (1978). The Book of Golden Discs (2nd ed.). London: Barrie and Jenkins Ltd. p. 314. ISBN 0-214-20512-6. ^ "JERMAINE JACKSON & PIA ZADORA – full Official Chart History – Official Charts Company". ^ "Greatest Hits and Rare Classics by Jermaine Jackson on iTunes". ^ "Jermaine Eviction :CBB5 Celebrity Big Brother 5". May 7, 2007. Retrieved April 5, 2014. ^ "Gone Country 2 : Cast : John Rich Hosts : Celebrities Compete For New Country Music". CMT. Retrieved April 10, 2014. ^ "Watch Celebrity Wife Swap TV Show - ABC.com". Abc.go.com. Retrieved April 10, 2014. ^ "Jermaine and Halima on "Celebrity Wife Swap" Season 3". Jackson-source.com. March 29, 2014. Retrieved April 5, 2014. ^ Morabito, Andrea (April 14, 2014). "Jermaine Jackson gets testy in 'Celebrity Wife Swap' premiere". nypost.com. Retrieved April 23, 2014. ^ Wynne-Jones, Ros (April 7, 2007). "MAGIC BUS ; Last stop against racism". Daily Mirror via ProQuest News UK. p. 14. Retrieved July 4, 2008. ^ erintuckerisaBITCH (July 7, 2009). "Michael Jackson Memorial Funeral Jermaine Sings Smile at staples center" – via YouTube. ^ "Jermaine Jackson Brings 'Smile,' Tears To Michael Jackson Memorial". Mtv.com. July 7, 2009. Retrieved April 10, 2014. ^ a b TV.com. "The Jacksons: A Family Dynasty". ^ Janneke. "Let's Get Serious (1980) – Jermaine Jackson – #1 source for anything JJ!". ^ "You Are Not Alone (9780007435678): Jermaine Jackson: Books". Amazon.com. Retrieved April 9, 2012. ^ "Luka Neskovic: Jermaine Jackson on His Brother Michael and First Tour in 30 Years". Huffingtonpost.ca. Retrieved November 11, 2012. ^ "I Wish You Love : Jermaine's new album !". Jermaine Jackson Entertainment. Archived from the original on January 7, 2015. Retrieved April 10, 2014. ^ "♫ I Wish You Love (feat. David Serero) – Jermaine Jackson. Listen @cdbaby". ^ "Watch YOU ARE NOT ALONE, The only JACKSON MUSICAL by JERMAINE JACKSON () online – Amazon Video". ^ "♫ You Are Not Alone: The Musical – Jermaine Jackson. Listen @cdbaby". ^ "Monster plans Michael Jackson tribute at CES". USA Today. January 1, 2016. ^ "At home with Jermaine Jackson and family- Hello! Magazine". Positivelymichael.com. Retrieved April 10, 2014. ^ "Jermaine Jackson's Wife Arrested for Domestic Violence". TMZ. December 2, 2015. ^ Jermaine Jackson's Wife Files for Divorce. TMZ.com (June 23, 2016). Retrieved on 2017-01-05. ^ "Top 10 Rockers Who Found God: Jermaine Jackson". Rolling Stone. December 10, 2010. ^ "Jermaine Jackson: Michael Had Escape Plan". ABC News. September 13, 2011. ^ myfavoritemrtvshow (June 25, 2010). "Jermaine Jackson @ Larry King Live Part 4" – via YouTube. ^ "Michael Jackson's death: Jermaine Jackson speaks". Los Angeles Times. June 25, 2009. Retrieved April 5, 2014. Wikimedia Commons has media related to Jermaine Jackson (musician).